Peanut Butter Cookie Dough Billionaire Bars- buttery shortbread topped with gooey caramel, peanut butter cookie dough, and chocolate ganache. Swoon! Whoa boy! Do I have a treat for you today, my friend! 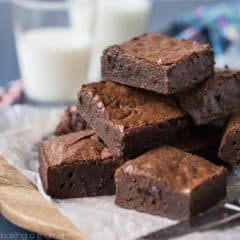 With Superbowl coming up, I thought I should arm you with the perfect dessert recipe, and this is IT! 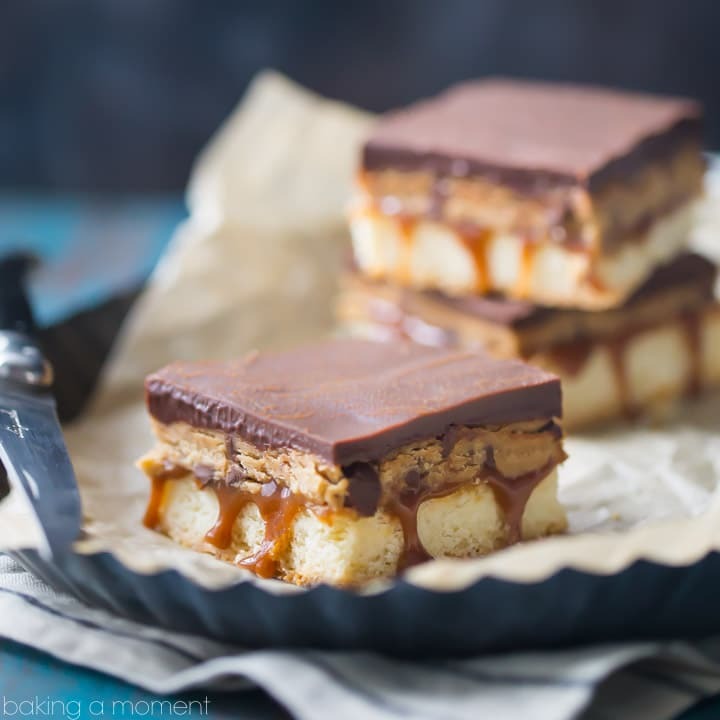 These peanut butter cookie dough billionaire bars will have your friends begging you for more. They are SO indulgent! I made these a few weeks ago when we had friends over, and I could not stop grabbing for them. They’re super rich and they’ve got everything you could ever want in a dessert and more. Crunchy, gooey, chocolate-y, and creamy. 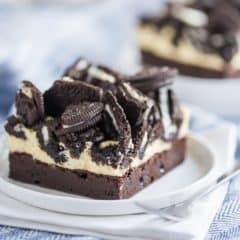 I’ve talked before about what I think a Superbowl dessert should be. Indulgent definitely tops the list. 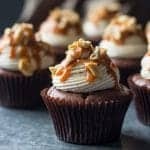 Peanut butter and chocolate are always crowd-pleasers. But most importantly, it should be finger food. You have to be able to sit on a sofa (and maybe jump up and cheer every so often) while eating it. 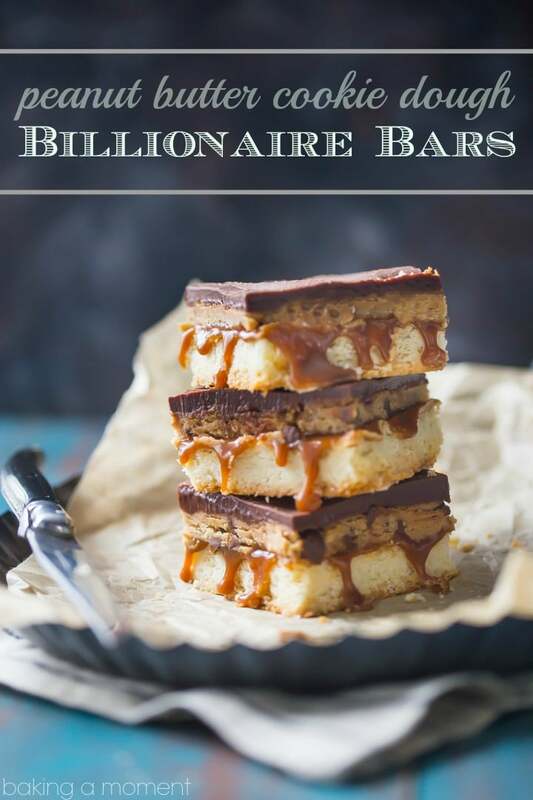 Billionaire bars are the perfect solution. 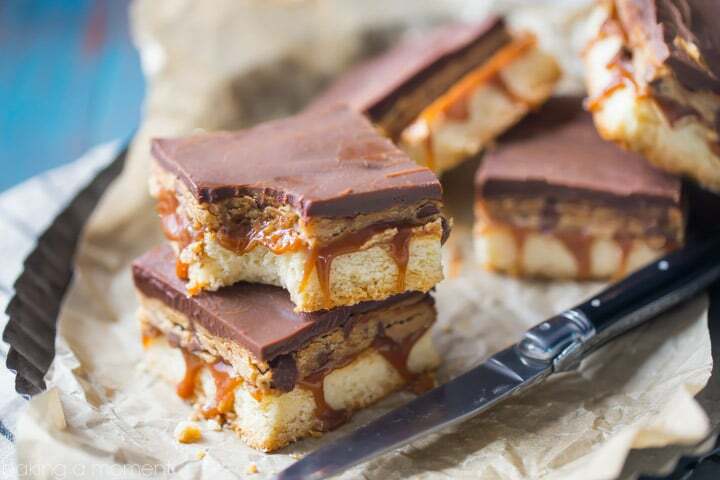 With a sturdy base of crumbly, buttery shortbread, a gooey layer of salted caramel, and all that rich, melt-in-your mouth chocolate, they just can’t be beat. That is, unless you take them next level with a layer of peanut butter cookie dough. So over-the-top! Don’t worry, this peanut butter cookie dough is perfectly safe to eat because there are no eggs. Edible peanut butter cookie dough! And since we’re indulging, why not add some extra chocolate chips in there too. 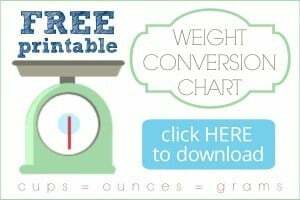 I’m telling you- your guests won’t be able to get enough! Got any fun plans for the big game this weekend? Whatever you’re doing, I hope there’s good food and lots of fun involved! Preheat the oven to 350 degrees F and line a 9 by 9-inch pan with parchment paper. Place the butter and powdered sugar in a large mixing bowl and beat on medium-high speed for 3 to 5 minutes, or until very pale and fluffy. Stir in the vanilla extract until incorporated. Add the flour and salt, and stir on medium speed just until smooth. Press the dough into the bottom of the prepared pan, in an even layer. Bake for 22 to 28 minutes, or until just beginning to turn golden around the edges. In a small pot, gently heat the cream, butter, and salt until the butter has melted and the salt has completely dissolved. Remove from heat and add the vanilla. Place the sugar, corn syrup, and water in a medium pot and cook over medium-high heat, swirling the pot occasionally to distribute the heat evenly. Boil the sugar mixture until the bubbles begin to get smaller and it becomes amber-colored, then reduce the heat to low and pour in the warm cream mixture. Whisk constantly to avoid lumps or crystals, and continue to cook until a candy thermometer registers 240 degrees F.
Immediately transfer the hot mixture to a heat-safe vessel, cool until slightly thickened, and pour the warm caramel over the shortbread. Allow to cool before layering with peanut butter chocolate chip cookie dough. Place the butter and brown sugar in a large mixing bowl, and beat on medium-high speed for 3 to 5 minutes, or until very pale and fluffy. Stir in the peanut butter until smooth. Scrape the bottom and sides of the bowl with a silicone spatula, then stir in the flour until smooth. Mix in the vanilla and salt, then spread the mixture over the caramel and top with ganache. Place the chopped chocolate in a medium mixing bowl. Heat the cream in a small pot until just barely simmering, then pour it over the chocolate and let stand for about 3 minutes. Stir the ganache gently with a silicone spatula, until smooth. Pour the ganache over the edible cookie dough in an even layer. Allow to cool until set, then run a thin knife around the edges and remove from the pan. 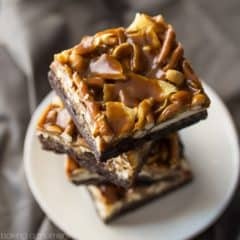 Cut into bars just before serving. *For a full picture tutorial, see my Salted Caramel Sauce post. Oh my word Allie I died when I saw the picture of these!!! These are perfect for game day for sure!!! Thank you so much Malinda! Hope you have a fun one! Peanut butter cookie dough!!! Why is this not more of this in my life! Girl I know the feeling. 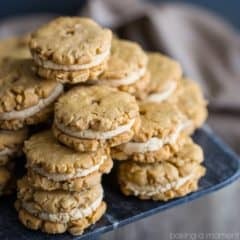 We should all just be eating peanut butter cookie dough, all the time. The world would be a happier place! I have family visiting soon. 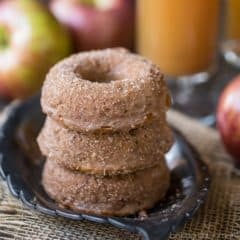 I need to make these for them! Hope you enjoy! Have fun with your family, and thanks so much for stopping by! ohhh my stars! 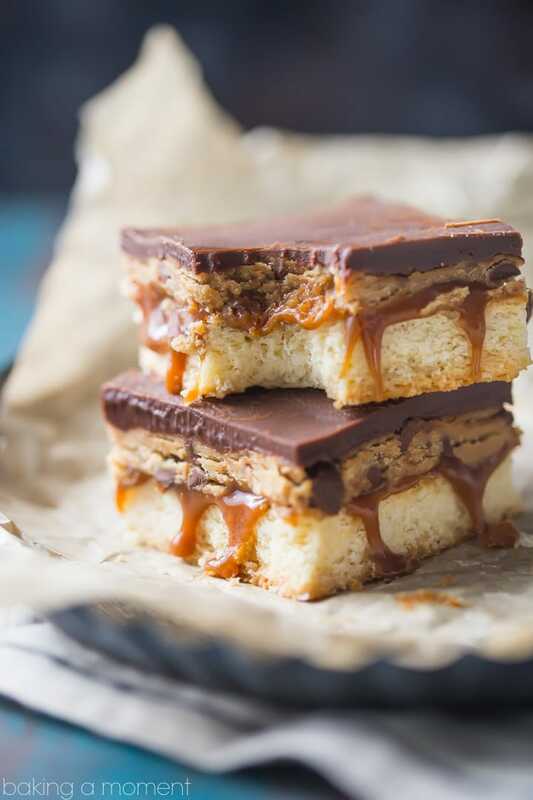 Adding pb cookie dough totally takes these bars to the NEXT LEVEL. so so soooo good! Peanut butter cookie dough is truly one of life’s greatest pleasures. So happy you agree! Thanks for the sweet comment Kayle!